With welded liquid-tight corners, suitable for up to 25 litre containers. For distribution of containers of liquids of up to 25 litres. Bonded storage of up to 25 litre containers of liquids. Seam welded with galvanised removable floor grid. With sump, for 2 vertical or one horizontal drum. 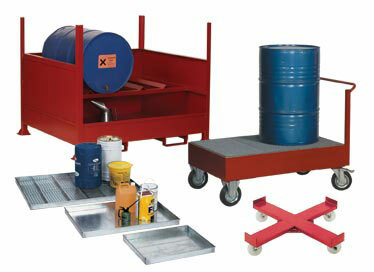 For vertical or horizontal storage of liquids in drums. For safe storage of 1000 litre intermediate bulk containers.